How Far is Celebrity Square? Celebrity Square, a residential project located in Bangalore, developed by Celebrity Structures India Private Limited. This project offers thoughtfully designed Ready to move 3 BHK apartment for sale in Sarjapur Attibele Road. Home is a place where you will spend time with your family and a place where you start your story of life. Celebrity Square offers a perfect place where you can find your dream home, come and be a part of Celebrity Square and spend joyous life with your family. This project has 65 % of Pure breath space, well ventilated with optimum space utilization. Celebrity Square is situated in one of the rapidly developing areas of the Bangalore city which is dotted with educational institutions, hospitals, shopping complexes, IT companies and located close to Attibele industrial hub and neighboring Hosur SEZ. Being residents of this project, you will stay close to well-known localities of the Bangalore city, some of them are HSR layout, Chandapura, Jigala, Bommasandra Industrial area, Adigondanahalli and more. Come and grab this golden opportunity of owning the best 3BHK apartments in Bangalore at Sarjapur Attibele Road. 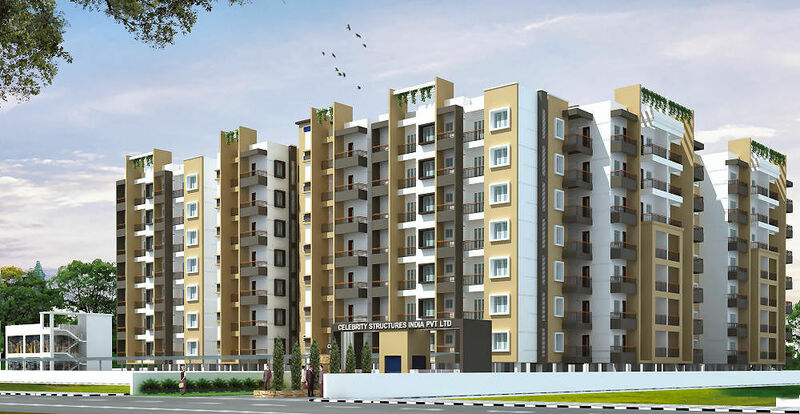 Along with all these advantages and 3BHK apartments at Sarjapur Attibele Road, Celebrity Square offers many useful amenities, some of them are shuttle court, super market, avenue trees, gym, badminton court, indoor games, swimming pool, clubhouse, shopping area, sewage treatment plant and parking. Celebrity's Square is well connected to major locations like Koramangala, BTM, Silk Board, Marthahalli, Hosur road and International Airport. Close proximity to all international schools and hospitals and Super markets and Malls. Celebrity Square is vaasthu oriented apartments available with East, North and West facings. Dimensions starting from 785 sqft to 1112 sqft. With all Basic Amenities like Sprawling clubhouse, Swimming pool, Gymnasium, Indoor games,children's play area, Landscaped, Shuttle court, Car Washing bay, Super Market, Entrance plaza, Power backup, Sewage treatment plant, Lifts,Round clock Security, Rain water harvesting. Provision for washing machine, water line and drainage, with ceramic tile flooring. Main door frames of Teak wood, shutter of teak veneer. Iside doors salwood frame with solid tough shutter with superial quality enamel paint. Vitrified tiles for living and dinning. Standard size stainless steel sink with drain board. Ceramic glazed tiles dado up to 2’0″ht above platform. Aluminium sliding windows with guard bars with glass for bedrooms. Anchor or equivalent wiring – concealed conduct copper wiring. Pressure checked plumbing and drainage lines to ensure total leak proof toilets. Provision for geyser. Select glazed/ceramic tile dado up to 7’height. Provision for drinking water and Borewell with sump and overhead Tank. Polishing for main doors, All doors and grill with enamel painting. OBD for internal walls and ACE paints for external walls. 6 lifts with backup power supply.